As I posted here, I’ve been involved in the Fox/Hamilton Music Mentoring program since the begining. Many years. The school were the mentees come from, Hamilton High School, is a LAUSD Magnet school for both humanities and music. Our kids come from the music academy. They are aweseome kids. Motivated, talented and open. They come from all over the city and they want to go to that school. It’s not just their neighborhood school. LAUSD has this school because there are no more music programs in school. Which is a shame – the part about no more music programs, not the magnet school part. I wish there was performing arts in schools. America needs it and the world needs it. I believe our culture (music, movies, tv and general “westerness”) is our biggest export. If there are no more music and performing arts programs how are we going to grow our kids and their talents? Not to mention it’s a proven fact that there is a correlation between studying music and developing math skills. Not to mention patience, learning how to learn, dexterity, developing memory, etc, etc. 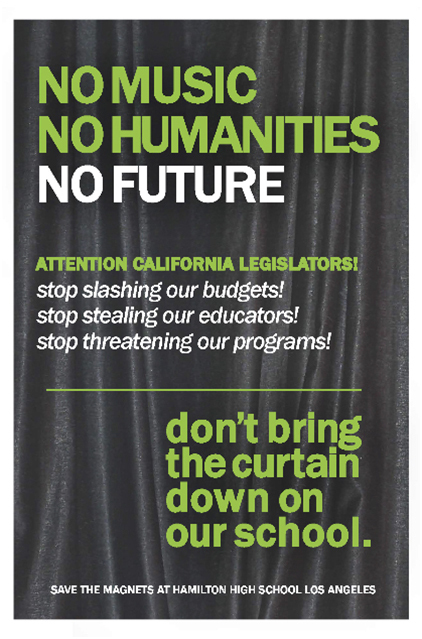 Shame on LAUSD and the City of Los Angeles and the State of California for not supporting education programs, performing arts programs and music programs. Here’s a link to the Hamilton Academy of Music action outreach. This entry was posted on Thursday, March 17th, 2011 at 20:15. It is filed under Uncategorized and tagged with Hamilton, high school. education, lausd, mentoring, music. You can follow any responses to this entry through the RSS 2.0 feed.